704 Games has put out a few NASCAR-based titles on Android and iOS in the past, including NASCAR Heat Mobile and NASCAR Manager, both of which are pretty intensive, intricate games for those who want to enjoy a more realistic racing experience. 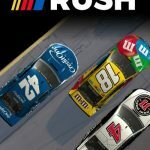 But for those who prefer to keep things as simple as possible, you may be interested in NASCAR Rush, which is now out on iOS and Android, again brought to us by 704 Games. The game boasts of single tap controls for switching lanes, a collection of several real-life NASCAR drivers and tracks (including all 23 tracks from the Monster Energy NASCAR Cup Series), and a card collecting game mechanic which allows you to improve your car’s performance. There are three distinct racing modes — Missions, Endless Race, and Live Event — and in all cases, you don’t need to worry about any of the bells and whistles you need to be mindful of in more in-depth racing games. Arcade fun is the name of the game in this particular title! However, that doesn’t mean that this game doesn’t have some depth of its own. In fact, there are many things you need to learn if you want to collect all the cards, level up faster, and get the most out of this rather unique, albeit simplified, racing experience. Read on, as we’ve got several tips and tricks that can help you out with those things and more, in this NASCAR Rush strategy guide for beginners. We’ve got another guide coming for more advanced players, so be sure to watch out for that one as well! One of the very first things you will notice about NASCAR Rush is that it’s not like what you may be expecting, considering that there has been tons of official NASCAR games for multiple platforms that allow you to take part in complete races and seasons, create your own driver, etc. Instead, this game distills things to their most basic and bare-bones, with the exception of the stunning graphics. We’re talking about pure arcade fun in a game that’s specifically designed for the mobile gamer, but even if the basics are very easy to learn, we’re going to break them down for you anyway. First of all, all you need to do in the game is to switch lanes, tapping on the left side of the screen to move left, and on the right screen to move right. Acceleration and steering is automatic, so the only things you need to be mindful of are moving to the right lane and avoiding contact with other cars. Although the term “rubbing is racing” is quite well known among fans of the real NASCAR, mere “rubbing” will take its toll on your car’s body. But you don’t need to worry about not finishing a race in the traditional form, because the races here do not have a definite number of laps. They can, in theory, be endless, as seen in the Endless Race game mode, but when playing in Missions mode, they last as long as you’ve got missions to complete. Also worth noting is that there’s no such thing as first place or a podium finish in this game. 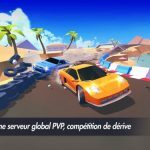 It’s all about completing tasks in order to collect more cards and further improve your car, because once again, the makers of this game have tried to create a NASCAR racing experience that’s designed with mobile gamers in mind. That pretty much sums up the simplest things about NASCAR Rush, so let’s move on to some other things you need to know before starting your first race, specifically if you’re having difficulty choosing which driver to represent you as your avatar. Other NASCAR-based games differentiate between the different real-life drivers and cars included in the game. 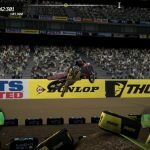 While NASCAR Rush features several actual Monster Energy Cup drivers, including all of the top names in the yearly series, the game makes it clear in one of the tips that show up while the screens are loading — everything’s cosmetic when it comes to the avatars. So if you’re someone who’s familiar with NASCAR who knows all the top drivers and many of the less heralded ones, it won’t matter which one you choose. Likewise, this could benefit those who aren’t too familiar, as you won’t need to go through several Wikipedia entries to find out who’s doing well — just choose any of the drivers, maybe someone whose car’s color scheme you like, and you can head off to the races. Most likely, you’ll be spending time completing the missions in the mode of the same name, which is where you’ll start out in anyway. These are tasks which you can achieve within the course of one, or even several runs, and these may run the gamut from running out of fuel or wearing out your tires in a race, repairing your parts to a certain extent, avoiding crashes for a certain number of laps, or even crashing your car within a number of laps as well. Depending on how easy the mission is, you’ll receive one of three prize crates — a small one, a medium one, or a large one. Obviously, it takes less time to open the small crate, as you only need to wait an hour. Medium crates take two hours to open, while the large, “Gold” crates can only be opened after four hours. What kinds of prizes can you expect within these crates? Generally, you will be receiving some gold (the game’s premium currency) and experience points, but the main things to look forward to are the cards, which you can collect in order to unlock new drivers and paint schemes. If you can’t wait to open these crates, you have the option to pay cash or premium currency (depending on the type of crate), or better yet, watch a video so you don’t need to part with your in-game currency. When maneuvering your car in NASCAR Rush, regardless of the game mode, the key to lasting long is to move your car to the clearest of the three lanes, the one which will give you the most wiggle room. Some may prefer to stay mainly in the center, or to go for the left lane, which would allow you to easily move into the pit lane in-between laps. But there really is no specific best lane to focus on when racing your car, regardless of the track. The only thing you should be taking into account is the amount of wiggle room you have so you can avoid crashing into another car. Take note that for each lap you complete, the track will get more crowded, with the cars more closely bunched up together, so you’ll have to act especially fast as you progress further into a race! From the second lap onward, you can expect to see these things happen every now and then — multi-car crashes that take out anything, and everything in their path for a span of a few seconds. The game will notify you about this when you see two series of red arrows and one series of yellow arrows on the three lanes. The red arrows should be avoided when you head into the path of the big pileup, while the yellow arrows will eventually turn green; make sure you stay there during the massive crash, because that will spare you from any kind of damage. Sometimes you may have to shift to one of the lanes with the red arrows, in order to avoid bumping into a car in the lane with the yellow arrows; make sure you do this as quickly as possible, because you wouldn’t want to be caught in a lane with red arrows while a plethora of cars are crashing into each other! Pit stop strategy is often the game changer in auto racing. If you’ve got a good pit crew, you can overachieve in a race by saving a few precious seconds each time you change your tires or refuel your car. But in NASCAR Rush, you’re not racing for first place; instead, you’re racing to complete missions or last a certain distance in an endless run. That means you’ll need to deal with pit stops in a different way. For starters, your car has three primary stats in the game — Tires, Body, and Fuel. Tires get worn out when you change lanes, your car’s body gets battered each time it bumps another car, and your car loses fuel with each passing second that you’re racing. As a rule of thumb, your goal during each pit stop is to focus on the areas that are at their lowest so that you can balance out your stats as closely as possible once you’re done pitting. But there may be times when you need to focus on a certain stat, primarily when you’re trying to complete a mission. That means you’ll want to focus on fixing your tires, for example, if one of the missions requires your tires to be repaired by a certain percentage, though you also shouldn’t neglect your car’s fuel or its body, so you can actually last long enough to make another pit stop and fix your tires some more. Each pit stop only gives you a few seconds to get as much repairs done as possible, so don’t let those seconds tick by without doing anything, or you’ll be wasting your pit stop! Also remember that your tires wear out and your fuel runs out faster for each time you take a pit stop. This one is explained early on in NASCAR Rush, and we did touch on the damage mechanic a couple of times so far in this beginner’s guide. But for the benefit of those who want it explained in a bit more detail, your car will take more damage if you hit another car head-on. Hitting a car on its side will also result in damage, and while it may not seem like much at first, you’ll still want to avoid this, as this could easily end a good run when you least expect it. What you’ll want to perfect, on the other hand, are the processes of drafting and pulling off a near-miss. Drafting means driving right behind another car in such a way that your car is slightly pulled forward without you needing to hit on the gas so much; this allows you to save more fuel and last longer in between pit stops. Near-misses are those times when you come ever so close to bumping another car head-on or on its side, but escape scot-free. As we’ve observed, drafting doesn’t have much of an impact on fuel consumption, and near-misses don’t directly earn you any rewards, but since they can sometimes be required of you in missions, you should nonetheless work on perfecting both tricks. After each run in NASCAR Rush, you’ll be able to win some cash, but you can earn even more if you spend about 30 seconds or so to watch an ad video. While this option always seems to be available, we would recommend saving those ad videos for those runs where you did especially well. Earning cash, as we’ll explain in a bit, can be quite easy in the game, but having even more common currency to spend definitely is not a bad thing, and the best way to add to your cash earnings is to watch those videos. Every several hours or so, the game will notify you about a free gift which you can claim at the in-game shop. That free gift, as far as we’ve seen, always comes in the form of 10 gold, which makes this method the best way of earning premium currency in the game that doesn’t involve spending real money. The missions only earn you a maximum of 3 gold when you open the Gold Crates; in here, you can earn a ton of gold in comparison if you’ve got your notifications on for those free gifts! You will need to watch an ad video before claiming your prize, but that 30 seconds is well worth the wait. 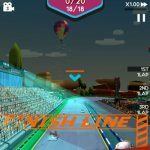 Earning cash should be no problem for you in NASCAR Rush — depending on how far you go in a run, you’ll be able to collect at least a few hundreds per run, except, of course, if you instantly crash and choose not to continue your run. You can also earn cash by clicking on the Trailer tab and clicking on the cash button on the lower right of the screen to collect your offline earnings, or win it by playing the Card Game — we shall discuss this two a little further in our intermediate to advanced strategy guide. You can spend cash if you wish to change your avatar, of when buying certain card packs in the shop. Most card packs can only be purchased with gold, which means you’ll generally be spending cash on the Paint Scheme Card Packs. Cash can also be used to unlock new tracks, which can be done once you’ve completed a certain number of tasks in Endless Race mode. Don’t be shy to spend your cash whenever the situation warrants it, because it’s very easy to grind for it in this game. Gold, on the other hand, is a harder commodity to earn in this game. There are many ways in which you can earn more gold, including the prize crates for your missions, your free gifts, the aforementioned Card Game, and by spending real money for a gold pack in the in-game shop. You’ll want to budget this carefully and save your gold for the Driver Packs in the shop, which would get you closer to unlocking new drivers in the game; we’ll be dealing with cards in our next guide, but just to set your expectations while early, it’s not easy to unlock a new driver whose card will enhance the stats of yours. The game will ask you if you want to spend gold to continue races (it’s initially free until you complete the tutorial stage), or if you want to open crates without waiting — we suggest spending your gold on neither one of those options, as patience is the key in a game like NASCAR Rush. Keep on grinding and going on as many runs as possible, and don’t fall to the temptation of spending gold to speed things up, or to continue a run that wasn’t really that good to begin with.